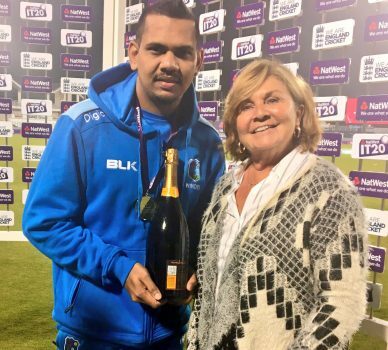 CHESTER-LE-STREET, England, CMC — West Indies bowlers — led by their captain Carlos Brathwaite, the irrepressible Kesrick Williams and the clever Sunil Narine — defied cold, wet conditions and proved their adaptability to usher their side to a 21-run victory over England in their Twenty20 International yesterday. 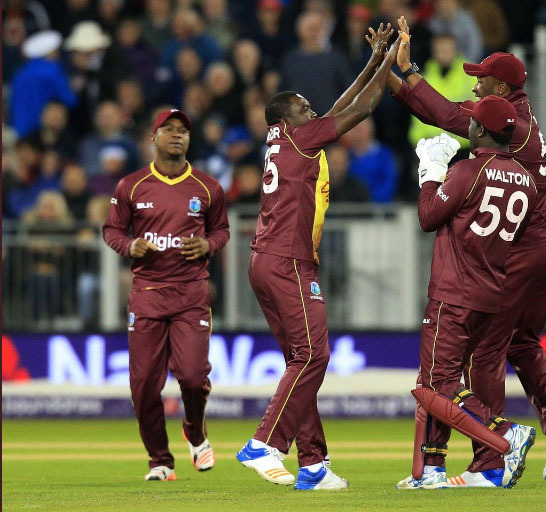 Brathwaite snared 3-20 from 3.3 overs, Williams took 3-35 from his allotted four overs and Narine, later named Player-of-the-Match, grabbed 2-15 from his four overs, as England were dismissed for 155 in pursuit of a victory target of 177 in the weather-affected match at the Riverside Stadium. The Windies overcame a slippery outfield that almost forced umpires Martin Gough and Tim Robinson to abandon the England chase in the fifth over, an Alex Hales 39-ball blitz for a top score of 43, and a rearguard from Jos Buttler and Jonny Bairstow to clinch their 11th victory over England in 15 matches in this format. Using a number of variations in the second half of the chase, the visitors made it difficult for the home team to lift the tempo late in the chase, as the last six wickets fell for 37 in the space of 36 balls. The embattled Brathwaite formalised the result with three balls remaining when he went past Liam Plunkett’s ugly swipe and bowled the England fast bowler to cap one of his better bowling performances in maroon since he was controversially elevated to captain last year. West Indies had failed to build upon a typically explosive start from Chris Gayle and fellow opener Evin Lewis, and were restricted to 176 for nine from their allocation of 20 overs, after they were sent in to bat under cloudy skies. Lewis led the way with 51 off 28 balls that included six fours and three sixes and Gayle smote three fours and four sixes in 40 from 21 balls in an opening stand of 77. After Gayle was run out in the seventh over, failing to beat Jason Roy’s throw from square leg to bowler Liam Plunkett in the seventh over, the rest of the innings lacked the same intensity and momentum. The Windies reached 106 for one at the halfway stage, but Plunkett and leg-spinner Adil Rashid grabbed three wickets apiece to undermine their batting in the second half of the innings. Jerome Taylor then gave West Indies the perfect start and silenced the capacity crowd, when he had Roy caught at backward point with the first ball of the chase. But Taylor and new ball partner Williams failed to find further consistency, and Hales made the most of an early reprieve to give the England chase early legs, putting on 64 for the second wicket with Root. Brathwaite made the breakthrough when he bowled Hales with the penultimate delivery in the final over of the Power Play to put England in a tailspin that saw them plunge to 68 for four in the eighth over. West Indies met further defiance from Buttler and Bairstow when they put on 50 for the fifth wicket with sensible batting, but with the scoring rate steadily increasing chances needed to be taken and the bottom half of the England batting failed to spark, as the Windies bowlers cleverly offered up a variety of cutters and change of pace deliveries.